The ILLEGALISED UK tour is now on sale! ILLEGALISED is protest-theatre exposing the dehumanising effects of the British State’s anti-immigration policies on migrants and those seeking asylum in the UK. ILLEGALISED is the first in BÉZNĂ’s cycle of multi-lingual plays denouncing Britain’s dehumanising of people for power and profit from colonial times to today. We believe that political and social theatre is a necessary tool in forming audiences’ political education and that it is their right to see it. This is why in Romania we use a funding model that allows us to present our work for free whilst all artists, creatives and collaborators are fully paid. In this way we make sure that people from all economic backgrounds have access to our work and are empowered, enraged and inspired to enact change in their society, irrespective of social class or economic potential. We aim to bring this model to the UK, to encourage artists, programmers and audiences to see social, political and educational theatre not as a commodity, but as a right. This is why our ticket prices are no more than an hour’s Living Wage in each of the cities we play in. When there is no justice, when the system is rigged, we make our own justice. We are showing an excerpt from ILLEGALISED at the People's Trial of the Home Office & the Hostile Environment. ILLEGALISED is protest-theatre exposing the dehumanising effects of the British State’s anti-immigration policies on migrants and those seeking asylum in the UK. ILLEGALISED is the first in BÉZNĂ’s cycle of multi-lingual plays denouncing Britain’s dehumanising of people for power and profit from colonial times to today. 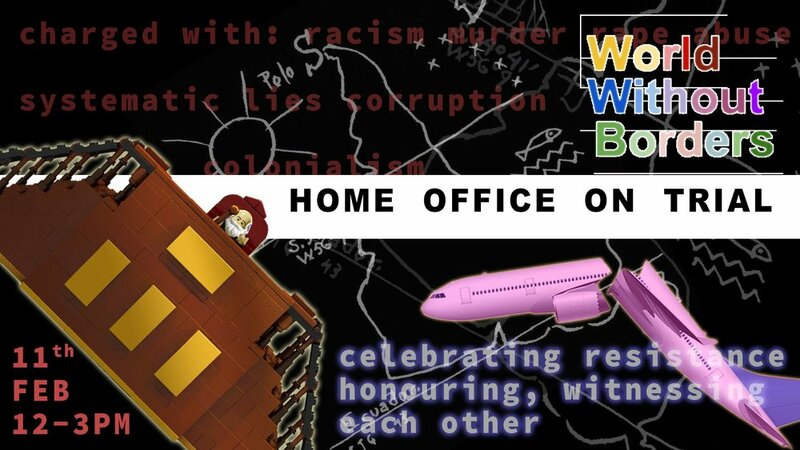 The protest will take place in front of the Home Office headquarters at 2 Marsham Street, London, United Kingdom. Find out more about the event here. Join the movement for solidarity! We are thrilled to announce the cast for the readings of ILLEGALISED. We will be joined by Lizzie Clarke, Kamran Vahabi, Andrea Păduraru and Theo Green, directed by BÉZNĂ’s Sînziana Koenig and Nico Vaccari. Inspired and informed by interviews with migrants, refugees and those seeking asylum, ILLEGALISED is the first part of a protest cycle denouncing Britain’s dehumanising of people for power and profit from colonial times to today. Jan 28th at Camden People's Theatre at 18.15. Tickets available here. The reading will be followed by a panel discussion with Dr. Monish Bhatia, criminology lecturer and activist and Alessandra Sciarra, development manager at Lewisham Refugee and Migrant Network. Jan 29th at Bookmarks the socialist bookshop at 18.30. Tickets available here. We are looking for a Set and Costume Designer for our next show ILLEGALISED. ILLEGALISED is the first play in a cycle denouncing the British State’s dehumanising of people from colonial times to today. ILLEGALISED is informed and inspired by interviews with migrants, refugees and those seeking asylum, investigates the Home Office’s inhumane practices and questions the ethics of immigration laws in the UK. This piece is the result of the fully funded R&D conducted Sept-Nov 2018 My Name is Other. Rehearsals will take place 25 March - 18 April at Applecart Arts in London. Minimum attendance required is 1-2 days a week during the first three weeks of rehearsals, then for 15-25 April plus a meet and greet and pre-production meetings. Northern Stage, Newcastle, Wednesday 22 – Friday 24 May (on sale soon). We welcome applications from designers who identify as BAME. If you are interested and available please send your CV to contact@beznatheatre.org with the subject ‘DESIGN CALLOUT’. We will be meeting people 28 Jan - 1 Feb, please let us know in the email when you can meet and whether it is via Skype or physically in London. Monday 28 January 6:15pm Camden People’s Theatre, NW1 2PY (reading followed by panel discussion) Tickets available here.